Ok, the pedal showed up--one day after we left for our west coast tour. Boo!! But I picked it up the day after we got back and finally had a chance to plug it in last night. It sounds fantastic! I haven't popped it open yet to see how it's set up but the tone pot sounds really good. The left to right is a bit stiff but I'm sure it will loosen up after playing it for a little while. So if you can grab one of these pedals I highly recommend it. The new pedals are made in Korea so I'm interested to see if the workmanship is any good. But I'll have to wait for a bit. Fender underestimated the interest in these pedals so they've been on back order since January. The one I ordered isn't due in until early June. I should mention that there's a notable difference between this new pedal and the vintage ones. The old ones had the input and the output on the right side of the pedal. And that makes a lot of since for the steel guitar. The new ones have the input on one side and the output on the other. Hope this doesn't cause too many issues. There's nothing I hate more than stepping on guitar cables. But--since I'm not playing pedal steel--it shouldn't be that big of an issue. I'll report back once I've had the opportunity to try this thing out. 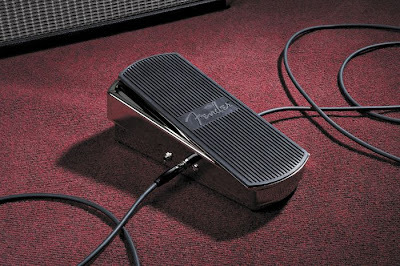 What has been your experience using this pedal? BTW, I've found that using L connectors on your plugs helps when the I/O is on either side of a pedal, specially on PSG. The old Fender pedal I have is a bit cranky. It seems that I have to spray it with contact cleaner quite a bit. But, overall, it's a good pedal.